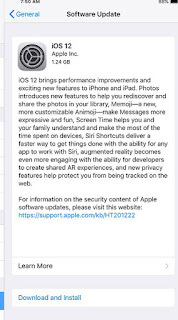 Apple Inc has just officially rolled out iOS 12, which is available for iPhone, iPad and iPad Touch. The update is now available for all eligible iOS device to download and install. 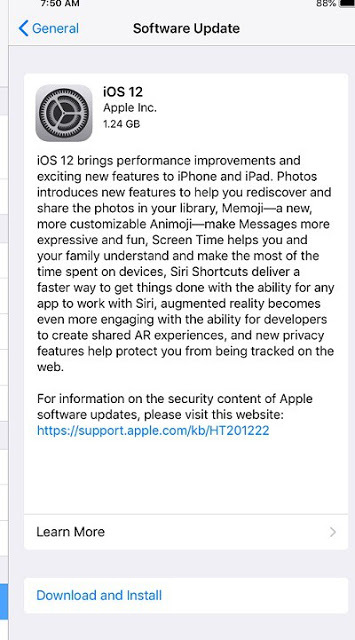 The new Apple iOS 12 update is the successor to iOS 11. The update came with new features and system enhancement, with even new iOS experience, faster and more responsive. Some of the noticeable features are improved performance, Siri Shortcuts, Memoji, Screen Time, Shared AR Experiences and more. Screen Time to track how long they spend on their phones and which apps they’ve been using, and improved notifications that are now grouped together by the app and far easier to manage or mute. There are also some fun new features, like Animoji and custom Memoji that you can create to look like you. Apps like iBooks, Stocks, Voice Memos, and Apple News are also getting redesigns. One of the biggest features — group FaceTime chats with up to 32 participants — has been delayed from the initial release until later this fall. iPad Pro (12.9-inch 2nd generation). Simply go to Settings » General » Software Update > Download and install. The update weighs in at about 1.24GB in size. Apple also released watchOS 5.0 for Apple Watch users. The watchOS 5 comes with an array of features like Walkie Talkie feature that lets you talk directly to family members using an Apple Watch. You can fire off a voice clip directly to another watch user with a tap of the wrist. Apple’s adding WebKit for watchOS so users can browse some website on the Watch, such as a restaurant menu optimized for the tiniest screen Apple sells. Podcast support will also come to the latest Apple Watch OS, as well as interactive notifications such as Siri Suggestions and Shortcuts. And lastly, Apple also released tvOS 12 for Apple TV that brings new Aerial Screensavers, Zero Sign-On, Dolby Atmos Support and more.